Well August came and went in what seemed to be a flash. With that went my reading too. I seem to have fallen off the reading horse. No books finished at all in August (unless you count hundreds and hundreds of children’s stories...no? Oh OK). Well a fresh new start for September. I’ve already said how much I love this time of year. 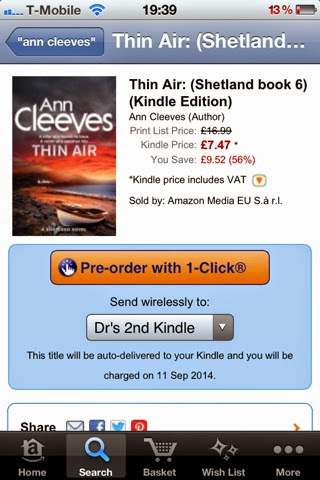 This September I will be reading the new Ann Cleeves novel in the ‘Shetland’ series 'Thin Air' (which is published tomorrow) and also finishing the Elizabeth Jane Howard novel (it’s good so I don’t know what happened to me!) I started in August. Once again joining in with Laura and the Year in Books. Funnily enough I read loads during August. My sleep suffered as a result though! I have four on the go this month. I haven't done a post yet. My blogging mojo has taken a knock. My Mum raves about the Shetland series of books. I'm on Elizabeth Jane Howard too - she's a great writer but I do find my inner 'reading voice' sounds awfully like Penelope Wilton, the narrator on the Radio 4 dramatisation. And children's books do count - they're great to read!